There can be no denying it anymore: Mark Dantonio has built an elite program at Michigan State. The Spartans have now won 11 or more games in four of the past five years including last year's breakout 2015-2016 campaign. Michigan State entered the year as a team that many saw challenging Ohio State in the Big Ten East but surpassed even those expectations. Despite some luck along the way (Michigan victory), MSU rode QB Connor Cook's passing and their usually-stout defense to a gritty Big Ten title and a Playoff berth. Although a 38-0 beatdown at the hand of eventual National Champion Alabama in the Cotton Bowl was rough to watch, Michigan State can still be very proud of what they accomplished this past season. While Connor Cook moves on, Dantonio's program has shown it can withstand some serious losses and still be serious contenders. Adjustments will have to be made, but don't underestimate the Spartans' chances of winning the Big Ten for the second straight year. 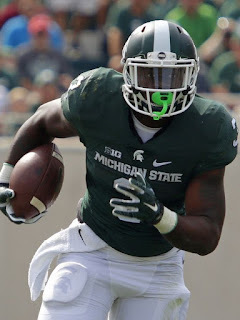 Backfield: People will criticize Cook's leadership (despite being a three-year starter he was never named a captain) and his arm strength, but he was very good in his time with MSU. He consistently improved year by year, including throwing for 3,131 yards and 24 touchdowns in '15. His graduation will spawn a competition between two main candidates: senior Tyler O'Connor and junior Damion Terry. O'Connor has seen slightly more action than Terry, coming in when Cook went down with injury in the Spartans' upset of Ohio State, though he threw just 12 times. O'Connor, a senior, has a great mind and decent arm and Dantonio may feel more comfortable with the veteran taking the reigns of the offense. However, Terry has a big arm and has shown the ability to make plays with his legs. Those two should also be challenged by redshirt freshman Brian Lewerke and newcomer Messiah DeWeaver. DeWeaver has lots of MSU fans excited; the signal-caller has shown wonderful upside and ability, and many people believe he is the future for MSU at the position. No matter who starts this year, Michigan State's offensive strategy should not change too much, they are going to run the football. Dantonio has produced studs like Javon Ringer, Le'Veon Bell and Jeremy Langford in his time with the Spartans, but used a committee last season. That entire committee is back in 2016, but expect sophomore L.J. Scott to emerge as the clear leader. Scott was extremely young last year but showed what he can do, rushing for 699 yards and 11 scores, including the game-clinching score against Iowa to seal the Big Ten Championship. Scott isn't a burner, but he finds success through great vision and patience, something very impressive for a guy as young as he is. While Scott may well become the feature back for MSU, expect fellow returnees Madre London and Gerald Holmes to see action. London was also very young last season, but still managed 500 yards and three touchdowns, while Holmes did most of his damage in the red zone, racking up eight touchdowns. London, now a sophomore, will hope to improve as a playmaker, as he was limited to just around four yards a carry (4.2) last year. Meanwhile, Holmes will once more be used a lot when the field gets short. Michigan State will have to replace fullback Trevor Pendleton, who Dantonio called the best fullback of his tenure with MSU. Receivers: Another major reason why Michigan State's aerial attack will almost certainly regress in 2016 is the loss of top wide out Aaron Burbridge. Burbridge broke out last year, picking up 1,258 yards and seven touchdowns on 85 receptions. The talented wide receiver proved he was one of the Big Ten's best at the position, and the Spartans will clearly miss him. The good news is that the cupboard is not completely bare at the position. Big things should be expected of senior R.J. Shelton, who finished off third on the Spartans in receiving, behind Burbridge and Macgarrett Kings, who is also gone. Shelton recorded 43 catches for 503 yards a year ago, and showed that he could consistently move the chains. 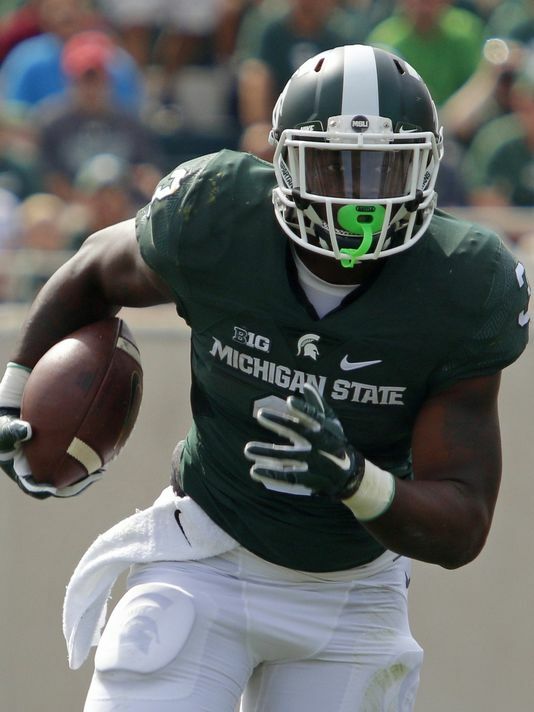 MSU will ask him to do much the same this year, just at a much higher volume. Although he is slightly undersized, Shelton should still use his highly reliable hands to put together a very big season. Sophomore Felton Davis could also be in store for a big '16, after showing brief flashes last season. Davis had just two receptions all of last year as a true freshman, although they were some big plays, picking up 50 yards. 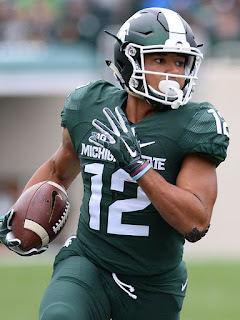 He has shown excellent speed and explosiveness in spring and could become MSU's top deep threat weapon, although you wonder how much Dantonio and co-offensive coordinators Jim Bollman and Dave Warner will throw the ball deep with an inexperienced quarterback. The Spartans are also hoping for big things from another unproven commodity in newcomer Donnie Corley. Corley is a local product, coming from Detroit, who is rated as a four-star recruit. He possesses good size and length, and has a bright future in East Lansing. Beyond those guys, there is even more inexperience throughout the receiver corps. There certainly is talent, yes, but you wonder how much these young guys will help out the offense. Cam Chambers has fantastic potential, as an East Coast steal by the Michigan State staff. Yet, he isn't an extremely refined route runner and isn't explosive. Another newcomer, Justin Layne, comes in as a four-star product from Cleveland, who could find his way on to the field. There is some hope that a solid group of seniors could play an increased role, most likely Monty Madaris or Edward Barksdale. Madaris saw some action last season, with two receptions for 47 yards. A major returnee to the unit is senior tight end Josiah Price, a stable playmaker. Price is a strong blocker that is a major helper in the red zone, but he may have to do more this season. Price had 23 catches and six touchdowns last season, and will continue to be an imposing target in the passing game. Senior Jamal Lyles is underrated, and will back up Price at the position in 2016. Overall, the unit is full of questions and will definitely need someone to step up and emerge as a No. 1, but the talent and potential throughout it clearly exists. Offensive Line: In order to be a good Big Ten team, usually a great offensive line is critical. That proved to true last season for Michigan State, whose offense excelled behind an experienced and deep O-Line. Unfortunately, they lose some pretty key pieces, most notably NFL Draft pick Jack Conklin at tackle, along with quality center Jack Allen. Those guys will be missed, but the Spartans could still be very tough throughout the unit in '16. Senior Kodi Kieler is an important piece, as the veteran is sure to lock down the right tackle spot. Kieler has fantastic size and knows how to block in the physical Big Ten, with 11 starts a year ago. In the interior of the unit, the Spartans will lean heavily on the services of junior Brian Allen at center. Allen has proven he can be dominant at times, and earned Freshman All-American honors in 2014, but didn't see as much action last season. He should be a solid piece up the middle that will work hard to form some chemistry with whoever takes over at the quarterback position. The Spartans will also hope for a big year from senior Benny McGowan, who saw action last year due to some injuries. McGowan is a great run blocker with solid mobility, that should lead the charge for Scott, who will be MSU's workhorse. McGowan is most natural at left guard, while the right guard position should almost certainly be a question mark. Sophomore David Beedle has plenty of upside, but senior Brandon Clemons and others could certainly push him. The left tackle slot, which was formerly Conklin's area, is another question mark. Junior Dennis Finley is the most experienced piece, and has bulked up quite a bit this offseason. Redshirt freshman Cole Chewins and newcomer A.J. Arcuri are also competing for action. Arcuri has a lot of MSU faithful hopeful because of his massive frame (6'7", 275 pounds), which he'll almost certainly add to in due time. Defensive Line: The Spartans got big news last season when defensive end Shilique Calhoun decided to stay in school for another year and leave his NFL Draft dreams on hold for the time being. Combined with the healthy return of Lawrence Thomas and rising defensive tackle Malik McDowell, the Spartans had one of the best defensive lines inside the Big Ten and the nation a year ago. Calhoun did not disappoint, recording 15.5 tackles for loss and 10.5 sacks before heading to the Oakland Raiders in the third round of the NFL Draft. Thomas also was solid, with three sacks, but he departs. That leaves the defensive end spots with some question marks, but MSU still has a legit stud returning in McDowell, who enters his junior season. McDowell is a former big-time recruit who has showcased his amazing talent throughout his time with the Spartans, earning 2nd-Team All-Big Ten honors last year. He should build on that this year, as he brings fabulous athleticism and raw power to the equation. McDowell is a disruptive force, picking up 13 tackles for loss and many NFL scouts see McDowell as a No. 1 overall pick in the 2017 NFL Draft, although that is obviously far away. McDowell will be joined in the heart of the unit likely by redshirt freshman Raequan Williams. Williams will take over the position that was once Joel Heath's, another strong run defender. Williams doesn't have Heath's experience, but he has an incredibly high ceiling. He is a tremendous athlete, and opposing offensive lines will have troubles containing both McDowell and Williams up the middle. The most obvious candidate to replace Calhoun's production at defensive end has to be junior Demetrius Cooper. Cooper proved that he could get after the quarterback last year, compiling five sacks as a reserve. Cooper has great versatility, and Michigan State will look for him to make plays in a variety of ways. The other defensive end spot is going to be an open competition. Sophomore Dillon Alexander, incoming freshman Josh King and Jamal Lyle, their backup tight end, will fight for playing time. Alexander has slightly more experience and comfortability in the defense, but King is a highly touted prospect out of Darien, Illinois. Linebackers: For years, Max Bullough played an integral role in the Michigan State defense, as the middle linebacker made plays all over the field and was key to the Spartans' defensive success for a large chunk of the Mark Dantonio era. Max is long gone, but his younger brother, Riley, has shown he may be even better. Riley, entering his senior season, picked up 106 tackles and four sacks last year and will enter this year as an All-American possibility. Riley doesn't have the instincts of his older brother, but relies more on athleticism and explosiveness. He is a solid coverage option as well, with two interceptions and two pass deflections in 2015. Riley Bullough will be supported in the linebacker corps by junior Jon Reschke, a solid playmaker. Reschke is more of a pass rusher off the edge, in the "Star" position. He proved he could get after the quarterback last year, with two sacks and eight quarterback hurries. He may not have the same impact as Bullough, but Reschke and his experience will still play a key role in the MSU defense. The final linebacker position is going to be interesting to watch. Junior Chris Frey has the chance to start, but the Spartans also have senior Ed Davis coming back. Frey is a decent linebacker with good instincts, while Davis has proven himself to be quite the contributor when healthy. Davis was extremely disruptive off the edge in 2014, picking up 58 tackles, seven sacks and five tackles for loss. Unfortunately, he was lost for the year in '15, after tearing his ACL in fall camp. There are some questions about his eligibility for next year, as he will need to take summer classes to graduate and participate, but his return could be huge for the Spartans. Another interesting player to watch in the unit is yet another Bullough, Byron, who returns for his sophomore campaign. Byron showed he could certainly make plays when called upon last year, with 26 tackles and one interception. He is likely to back up Riley at the middle linebacker spot, or "Mike". Secondary: A major reason for Michigan State's defensive success under Mark Dantonio is because they play sound, disciplined football and that begins with the secondary. MSU does a great job of recruiting high-quality pieces to their defensive backfield, and unit should almost certainly be a major strength for them in '16. Junior safety Montae Nicholson is perhaps the most important player back, after he finished off third on the team in tackles last year. Nicholson had 83 total tackles last year, while also displaying great ball skills, finishing off with three interceptions. Nicholson will most likely down the strong safety role this year, and will be counted on to make a variety of plays. Also back at the safety position is going to be senior Demetrius Cox, a rock-solid defender. Cox, who is going to start at free safety, possesses outstanding versatility. He'll assist in run support and uses his good length to make plays defending the pass. The combination of Nicholson and Cox in the back gives Michigan State plenty of security, which is key. The cornerback positions should also be in very good hands, as senior Darian Hicks is back. Hicks proved he could make plays a year ago, with 33 tackles, but is still growing. He has continued to bulk up and get stronger, and will work on picking off passes and being a more complete coverage option. Helping him out will be the healthy return of sophomore Vayante Copeland. Copeland impressed in fall camp last year and was slated to be one of the Spartans' top defensive backs before a neck injury in the team's second game against Oregon. He was cleared for spring and has impressed early, as many see him as one of the most talented defenders on the team. He has good size and fabulous athleticism, which he hopes will bring him a successful and healthy 2016 campaign. The cornerback spots will have to absorb some losses, however, most notably Arjen Colquhoun, who picked up 45 tackles and 10 pass breakups last season. Senior Jermaine Edmondson's future is unclear as well. Edmondson made national news when reports of a fight between him and Golden State Warriors forward (and MSU alum) Draymond Green emerged. There have been reports of Edmondson seeking a transfer, and his status for the 2016 season is completely up in the air. An interesting piece to watch in the unit is sophomore Jalen Watts-Jackson, who hopes to be healthy and ready to go this season. Watts-Jackson returned Michigan punter Blake O'Neill's botched punt for the game-winning score, but it came with a cost, coming with a broken hip. There was worry it could seriously hurt his football career, but team doctors think he'll see the field this year, likely at safety. Special Teams: Senior kicker Michael Geiger made himself famous after knocking down the game-winning field goal against Ohio State then unleashing a crazy, odd celebration. He returns for his final year with MSU and aims to increase his consistency, after going 12/19 last year. Sophomore Jake Hartbarger is sure to lock down punter duties. The Spartans are hoping either R.J. Shelton or L.J. Scott can handle return duties. Michigan State has some losses this season, most notably Cook and Shilique Calhoun, and this is a team that does have question marks. Can their passing game survive the brutal Big Ten? Who will step up at receiver? Can they repeat a magical 2015 that saw them win a number of close games? Those are all valid concerns, but Dantonio has enough to get the job done this season. The Spartans have their next worhorse back in Scott, a talented offensive line and the defense should once more be among the nation's most stingy. The Big Ten East will be brutal this season, with Ohio State and Michigan both Top 10 teams, and Penn State still in the mix. Not helping MSU will be a cross-division meeting with Wisconsin, and a September 17th trip to Notre Dame. Even so, Michigan State should prove once more they have staying power. Unless injuries cripple them, this team should play a strong, disciplined brand of football that gives them double-digit wins and keeps them in the mix for a Big Ten crown.